On Creation Day 1, God made the earth, and gave it light. But on Day 4, earth needed another lamp, before He stretched the universe. That “Big Stretch” would cool the ambient light to a level that could never support life by itself. On Creation Day 3, God planted the earth, like a vast garden. The ambient light from creation still shone then, and bright enough to support photosynthesis. But now God was ready for His next step. 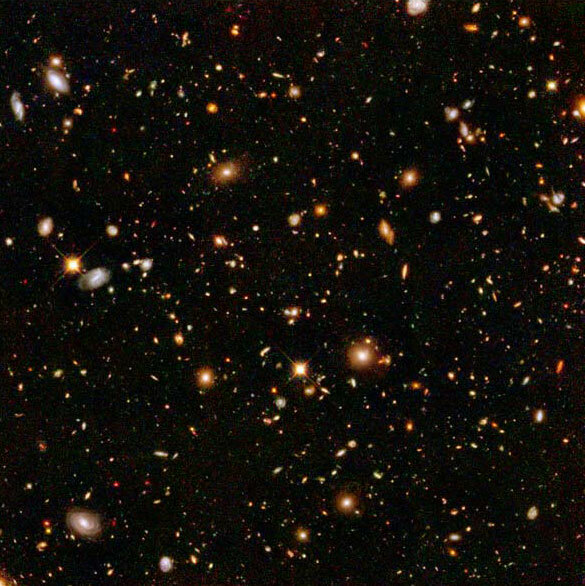 The Hubble Deep Field, a picture of some of the farthest objects in the universe. Objects like these are the posters for the starlight and time riddle. Photo: Hubble Space Telescope Science Institute. Let there be lights in the expanse of the heavens to separate the day from the night, and let them be for signs and for seasons and for days and years. The “expanse of the skies” is not the same expanse that God made on Creation Day 2. That expanse is the earth’s crust. This new expanse is the universe itself. the universe [began] growing from a patch as small as 10-26 m, one hundred billion times smaller than a proton. Convention then says that the universe grew during 10-34 second. In that amount of time, the light in the universe cooled to its present very low temperature. This is the Cosmic Microwave Background that we know today. Conclusion: the sun, moon, stars, and all the planets formed before the expansion. The universe was more dense then, but was not the infinitely hot “point” that the Big Bang assumes. Instead, the universe was about as hot as the Sun is today, with a density and volume to match. The Sun, to give daylight. The Moon, large enough to reflect part of the Sun’s light and to mark a twelfth part of the year. But God did not set the stars in the sky at random. The patterns, or constellations, in the sky are no accident. They do mark the seasons in a temperate climate (or even a semi-tropical one like that in Israel). The loose hydrogen in intergalactic space is ionized. That means that it has no electrons. The Big Bang theory cannot explain that. According to it, hydrogen ions (free protons and deuterons) should have captured their electrons. So what made them lose those electrons all over again? Many galaxies appear in long strings, something that should never happen under gravity alone. This might be the most obvious “stretch mark” other than the accelerated expansion. Black holes, the heaviest objects known, should never have formed after the Big Bang. What’s more, many of them are throwing out jets of matter, though nothing should escape them. The larger any given galaxy, the larger its central black hole. Furthermore, a galaxy often has many stars in a close orbit around its center. In an already tenuous universe, this should not be. The black hole would stop that from happening. Dwarf galaxies often appear in orbit around larger galaxies. (Our own galaxy has such a family.) How could any such object form in a less-dense environment? Finally, the universe has many pairs of galaxies that literally ran into each other. That kind of crowding happened before the Big Stretch, not after. Thus Creation Day 4 was at least as exciting a day as any in Creation Week. On this Day God made the universe in all its glory. And He already knew that He would make someone to appreciate it. This entry was posted in Apologetics and tagged creation, scientific theory by Terry Hurlbut. Bookmark the permalink. I don’t doubt that. But don’t ignore certain references, later than Genesis chapter 1, to God stretching out the heavens like a tent, etc. Those are the references that Walter T. Brown cited (and that I used). I belong to a Messianic Jewish Synagogue ( A Messianic Jewish Synagogue consists of Jews, & those of Jewish descent, & some Gentile Believers (whom God has called to that particular ministry) who believe that Yeshua/Jesus is the Messiah, God’s LAMB Who took away our sins when He was nailed to the execution stake/cross, & He rose from the dead & He is seated at the right hand of God the Father… and He’s coming back! Etc, etc. . A Messianic keeps a Jewish culture, & that includes learning Hebrew, & reading & studying the Hebrew Text. It’s not something that just the Rabbi/Pastor does… it’s something that everyone in the congregation is required to participate in. In other words the whole congregation is in the process of learning Hebrew, & studying the Hebrew text. Our Hebrew Teacher is now with the LORD, but when he was here, he was also into Creation Science & owned almost every media presentation that ICR & AIG had produced until just before he died. At the time he became my Hebrew teacher, he had been studying Hebrew for about 40 years. About 3 years before he died, he translated Genesis chapters 1 to 11, digging into the text from a Creationist perspective. (He favored Humphries interpretation of ‘raqia’.) His translation work also demonstrates that the Hebrew Text says that there are 2 bodies of water beyond outer space. Back to the part where Dr Walt Brown consulted the Jewish scholar at the Hebrew University in Jerusalem. That’s kind of like consulting a Pastor who isn’t a true Believer in Christ. A Messianic Jew would have not only helped him with the translation of the word ’raqia’, but would have also helped him dissect the Hebrew Text so that it wasn’t taken out of context. What is the purpose of the 2 waters that encase the universe? Are they what cause the Heavens to be stretched out? If those waters work like a whirlpool in a moving river, the size of the whirlpool can change. The center of the whirlpool is hollow, but it still has particles of water twirling around in the vacuum. Maybe the 2-waters work different than a whirlpool. Apparently, however they function, they are in constant movement, because the word for ‘deep’/tahome (which they are a part of) is something that is in constant movement. God says they are there, so how do they function? What is their relationship to outer space? Take that word ‘raqia’ & apply it to outer space. It’s some kind of ‘an extended surface’, & it comes from a word meaning something that is produced by ‘hammering, stamping, or stretching’. Keep in mind that that the expanse of outer space is a ‘thin thing’ in God’s sight, because even the Highest Heavens cannot contain Him! Do the waters continually beat/hammer the raqia so that it stays in place? How does it work?